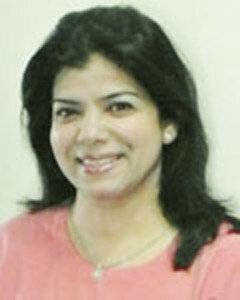 Anjali Awasthi Joshi is the Laboratory Director at Rotunda Fertility Clinic & Keyhole Surgery Center. She has been instrumental in setting up its ART lab and plays a key role in maintaining quality. She is also a visiting embryologist at the Rotunda satellite units. She did her Masters degree in Life Sciences and was awarded the Gold medal for that year. She was associated with various research projects in collaboration with the prestigious NIRRH, in Mammalian Reproductive Physiology. She was granted a scholarship for her research on “Effect of Heavy metals on the various cell types of anterior pituitary with special reference to “Inhibin and morphometric and functional changes in sperms”. She has taken formal training in Genetic Counselling. She has also led the ISO accreditation for the centre and is in charge of quality control in the unit . She has conducted several IUI/IVF/ICSI workshops and is actively involved in the academic and training programmes at the centre. She has contributed chapters to textbooks on various subjects and has attended many National and International conferences. She presented a paper on “Achieving higher implantation rate in IVF’’ at Indian Society of Assisted Reproduction in the year 2005. Mrs Joshi is a veteran in the field of ART. Prior to joining Rotunda Fertility Clinic, she worked as the Chief Embryologist and as Lab director in leading IVF centres. In her career spanning 15 years, she has handled thousands of IVF and ICSI cases. She has attended training programs at leading IVF centers in USA, Turkey, Israel, and Japan. She has taken extensive training in vitrification of oocytes and embryos at the Kato Ladies Clinic, Tokyo. Her skills include vitrification and thawing of oocytes and embryos. She has achieved a high success rate of Frozen Embryo Transfer and Oocyte vitrification . Anjali’s areas of interest are: Sperm morphological and funtional parameters, Extended culture , Assisted Hatching , Blastomere and trophectoderm biopsy , PGD , Vitrification of Embryos and Oocytes and Oocyte Banking. She believes in staying at the forefront of the latest developments in the field and in maintaining high standards in quality control. At Rotunda Fertility Clinic, she actively ensures that the patients can avail of the highest quality of patient care . Her gentle ways charm the staff and patients alike. Her hobbies include Music , reading ,travelling and gardening . We’d love to take care of you. Let us know how we can be of assistance. Copyright © 2018 Rotunda – The Center for Human Reproduction.